In my opinion, polka dots are as safe as stripes and plaid prints for the office. If you love patterns in general, I don't know why you would prevent yourself from wearing such a fun print. I know, everyone's work dress code is different, however, you can get away with wearing this print if you style it accordingly with your work environment. 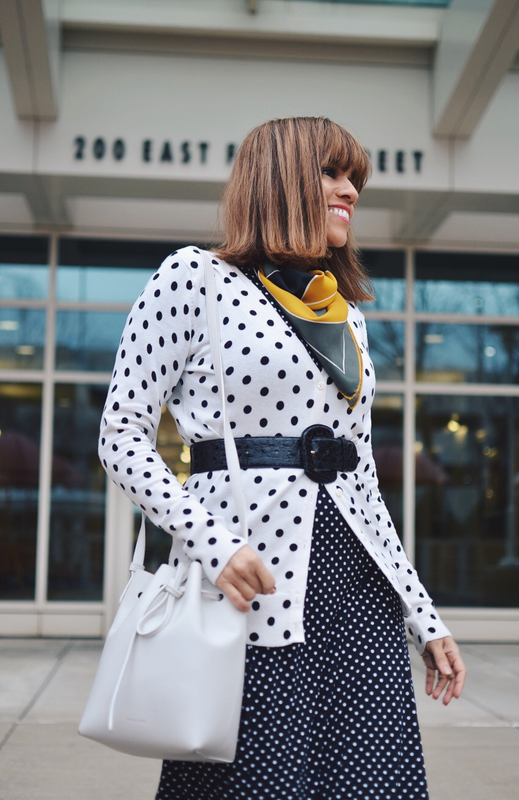 For example, if you are expected to wear suits to work, you can always wear a silk neutral-colored polka dot blouse with your suit or a scarf. In this case, the smaller the dot, the better. This way, you're following your work's conservative dress code rules, but at the same time, you're not depriving yourself of a little fun. If you work in a more artistic and flexible work environment, you can be a little more adventurous with your dots. 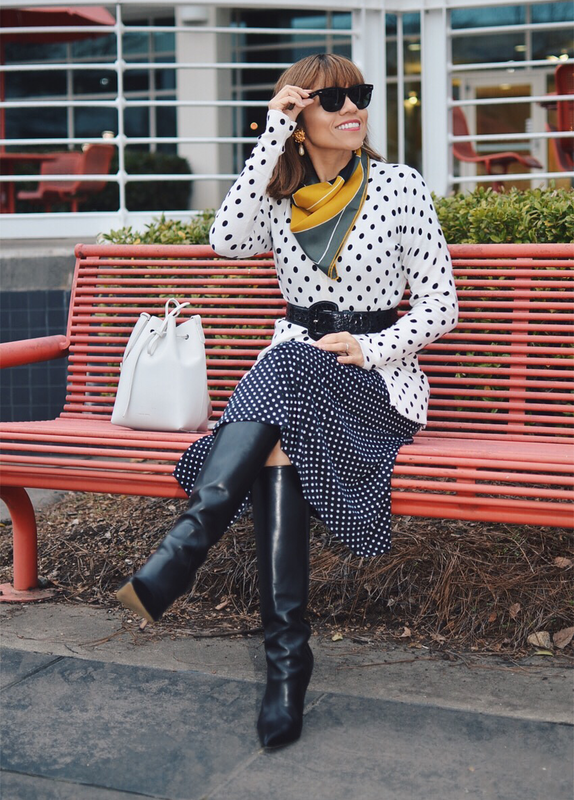 Pairing polka dots with other prints can be a fun idea, however, remember to keep things dimensional. Wearing prints of different sizes is the best way to go, so if you are wearing a small dotted piece, try to pair it with a garment that has larger prints. The look I'm wearing today it's a mix and match of dots (see pieces styled differently here, here and here) enhanced by a 1960's large printed scarf which, by the way, also serves as a pop of color. Noticed that the belt is embossed with an animal print, but since it's a total black piece, it worked as a solid and in conjunction with bag and boots, it helped to break up the prints. Cardigan: Target/Dress: Vintage/Bag: Mansur Gavriel/Belt: Vintage/Boots: Manolo Blahnik/Earrings: Vintage/Sunglasses: Ray-Ban/Scarf: Vintage. Rainy Day? I Keep On Moving!